Thoughts From An Expat Mom: Who Are You And What Have You Done With My Child? Sometimes the smallest creatures make the loudest noises, you know? 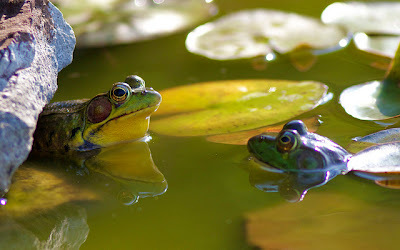 Bullfrogs and cicadas are two examples that come to mind, just off the top of my head. I'm sure if I spent two minutes on Google, I could come up with a list of at least ten to twelve more. And I'm also pretty certain that Skye would be on that list. Because she may be small, but the girl is LOUD. And what is super awesome is that as she gets older, her little lungs just keep on developing and she gets louder and louder. And louder. You see, there is a very good reason why I am sitting here, slumped over my laptop with a glass of wine in hand, my brain a bit hazy from the nonstop screaming that has been going on in our house since about...oh, 6:00a.m. and grateful for the miracle that is the fact that I managed to survive another day with that kid without locking myself in the closet and counting to one hundred. I'm also cursing the genius who came up with the phrase Terrible Twos, because it is, in fact, a lie. Not that it's not true, because it is. But it is inaccurate in that it gives parents false hope that the terribleness of it all will somehow END- as if by magic- when your child turns three. Anyone who has ever had a three-year-old in the history of the world will at this point start nodding their heads and chuckling, "Oh, yeah, I fell for that, too. FOR ABOUT A WEEK." Because it doesn't get better, it gets worse. They should start referring to it not as the Terrible Twos, but as The Terrible Time Between The Ages Of Two And Four When Your Child Will Act As If They'd Been Left In The Woods To Raise Themselves Since Birth. But I guess they can't call it that, or fewer people might sign on to this whole parenting thing. Better to have them believe that there will be one bad year, but the rest will be sunshine and butterflies. However, parents who are on their second child know better. We've been through it before. Fool me once, shame on you, but fool me twice, shame on ME. I know what to expect. I'm no stranger to this. Yet, somehow- SOMEHOW- it is still a surprise to me when I have to look down at my daughter on the floor, screaming, and say "Use your words, Skye, USE YOUR WORDS!" over and over about 10,000 times. On a side note, before I had kids, there was no phrase that got on my nerves when I heard people say it to their kids more than "Use your words! ", and now I find myself repeating it more times in a single day than I care to admit. Well, except maybe for, "Thank you for being a good listener! ", which I am also the queen of. I totally rock that saying. ROCK. IT. In three weeks, Skye will be turning three years old. Three! Now, a lot of people get nostalgic when their kids turn three, and start ruminating on where the time went and how they grow up so fast and all that. We tend to go in the opposite direction and silently think to ourselves, "Finally! Things will start to get easier soon! No more diapers! Full, coherent sentences that actually communicate needs and wants! And REAL VACATIONS!" You all, we are really looking forward to going on better vacations. Or ANY vacations, really, since most of the time we just stay home because traveling with a two-year-old just isn't worth it. Of course, we realize that in a few years we'll feel differently and every birthday will have the faint tune of "Sunrise, Sunset" wafting in the background, but for now, we relish the toddler birthdays. Mostly because, let me tell you, two-year-old Skye ain't easy, and we can fully see that three-year-old Skye will be even worse. This is made obvious by the fact that the number of her daily tantrums have tripled- TRIPLED- and she seems to have periods of time when she loses all ability to communicate in anything but screams and shrieks. However, anyone who reads this blog knows that for Skye, this is nothing new, really. What IS new is her habit of throwing herself on the ground and doing a re-enactment of several scenes from "The Exorcist" at the very mention of the word "No". It's not even "No", really- the "N" sound will barely escape our palate when she goes down for the count before we can even get to that all-important "O" part. She does not like that word...no, she certainly does not. What is also new is her total and absolute refusal to do ANYTHING when she is in a mood, as well as her habit of throwing toys and saying, "I don't WANT this!" and giving off threats such as, "I'm NOT going on the school bus! ", even though it is seven o'clock at night. I'm not sure why, but in her precious little toddler mind, the threat of not going on the school bus is just THE absolute worst that she can lay on us. She is fun, that one. I will give you an example from this morning. I'd gotten up at my usual time of five a.m. (yep, you read that right- FIVE A.M.) to make the kids' lunches and breakfast before getting into the shower to get myself ready for work. Now, in order for our mornings to go smoothly, the kids need to get up by 6:15 at the LATEST, eat their breakfast somewhat quickly and be in the shower by 6:50 so that we can get out the door by 7:15 with enough time to feel relaxed enough to actually start our day peacefully. So it should come as a surprise to nobody that at 6:35, I was still sitting next to a sobbing Skye, who was on the floor wailing because I told her that she couldn't use the iPad as soon as she opened her eyes this morning. I'd had the audacity to tell her that she had to- GASP!- play with her toys in the hour before her preschool bus came. What kind of parents are we, anyway? There were several back and forths that involved me firmly letting her know that this behavior wasn't acceptable and she would not get her way by displaying it, and she responding by screaming and throwing every toy that was within grabbing distance. Time-outs completely failed me and were utterly futile . Finally, at about 7:05, I threw any notion of a shower or breakfast out the window and just tried my best to get her into her clothes and brush her teeth. You can imagine how well that went. At exactly 7:12, she was sweetly sitting at the table, eating her eggs and telling me all about the things she was going to paint today in preschool. There is really no truer sign of a parent of a toddler than when they walk into work at 7:30 a.m. and already have a look about them as if they'd done battle with the devil that morning, and lost. Not just lost, but lost SPECTACULARLY. So I am looking forward to saying "Adios!" to the Terrible Twos and "Bring it on!" to the Thundering Threes, because as bad as I know they will be, they are followed by the Fabulous Fours, which I know from personal experience is when your kids resembling reasonable human beings, albeit with the newfound ability to argue every point that you make. But at least the arguing takes the form of words and phrases, which I will take over screaming and shrieks any day. What do YOU do about the Terrible Twos and Thundering Threes?? I'd tell you what I'd do Mairin, but I have blocked it from my memory, as if it didn't exist. It is a black hole. There's no going back. Wish I could help but you and Liam never went through the terrible 2s or thundering 3s. I was lucky. I know Skyelar has a very powerful set of lungs. She can go from sweet to sour in a nano second.